Wow! I can’t believe I have known my amazing girlfriend since 7th grade! So glad we are still friends and can enjoy time together with family over pizza and a few beers just for the ladies. Green Room was the place of choice Saturday night. How can you go wrong? Good beer, great music, awesome crew, and puppies! My kind of local hangout. It doesn’t get better than this! Wait, did I mention the good beer? Not only did we try the Green Room Zips Zythos hoppy ipa, we got to try the infamous White Devil (6.66% AVC). The White Devil was accompanied by this delightful description: “White Belgian IPA Cigar City lactose, wheat, rye, orange, and grapefruit peel” Any beer combined with Cigar City has two thumbs up from me. 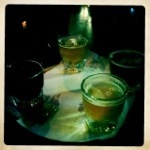 Definitely check out the new beers @ Green Room. Beer love…guaranteed! This post is long overdue and needs much more explanation, but I am going to let you know which amazing beers we “the crew” tried that infamous Saturday night @ Engine 15 in Jax Beach. I will be leaving out the amazing pina colada coated with cinnamon and oyster shooters along with some pineapple concoctions that put a well rounded end to a much enjoyed evening! Here is what was enjoyed…AVC % still needed along with detailed descriptions, but enjoy the list. Fabulous night with fabulous friends…more details to come.